Segmentation of professional bodies, creation of new professional bodies and bringing them closer to party lines are some of the innovative approaches adopted in Odisha. But how it fulfils constitutional obligation of a government and for that matter, a party, is a complex equation. Towards the last millennium, Odisha faced disastrous super cyclone which killed more than 10,000 people in a matter of a few hours. Even when the then Chief Minister Giridhar Gomango was not sure how to face the situation, the Chief Secretary, Sudhansu Bhusan Mishra left for the US on leave, citing some personal reasons. Nearly two decades have passed and there have been considerable changes on all fronts in Odisha which has seen four elections and one Chief Minister – the longest and uninterrupted in Odisha’s history. When rest of India is busy in decentralising welfare and development activities to districts and sub districts levels, Odisha is experimenting with inducting bureaucrats in higher echelons. Bureaucrats and secretarial officials are being reinstated or re-appointed in government departments, ignoring lakhs of educated and unemployed youth. This preferential treatment of officials over others has deprived the youth from any employment in the formal sector. The numbers and experiences of retired bureaucrats in Odisha being reinstated in contractual positions did not stop the Rs.55,000 Crore Posco from going away or the GI tag of Rasagolla which went to West Bengal. Odisha state has roped in ex-Mumbai cop and former IPS of Maharashtra cadre, Arup Patnaik to manage Biju Yuva Vahini (BYV). The state government has decided to spend Rs. 450 crore on BYV in the next three years. When there are formal outreach workers in health (ASHA workers), education and nutrition (AWW), livelihood (MNREGA workers) and the likes, why is there a need to form a youth cadre to cater to the village needs? Serving and retired bureaucrats are also encouraged to join active politics and contest elections with the assurance of getting tickets. The space and power assumed by Pyari Mohan Mohapatra waned when he passed away. But his rise in politics from the civil services cadre always nurtured hopes and political aspirations among serving bureaucrats. The unified bureaucrats often confront Central Government decisions and ministers. Even the current private secretary of Naveen Patnaik is a member of Indian Civil Services who is alleged to have been involved in party affairs from last general election held in 2014. Balabhadra Majhi, the outgoing MP of BJD of the 16th Lok Sabha (2014-2019) was once a bureaucrat in Railways. He left the BJD to join the BJP. Earlier, simple transfers and promotions of officials instead of getting clearance from the heads of departments were to wait for the CM’s approval. This created a centralised and an authoritarian set up in the state in 1936, almost more than two decades before India got freedom in 1947. There was a bid to start the functioning of the Vidhan Parishad, the upper house of the state assembly to accommodate some party leaders. 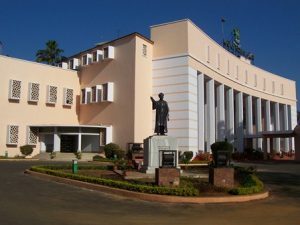 For the proposed Vidhan Parishad, a resolution was passed in state assembly with the strength of 49 members or one-third size of the state assembly. Somehow, the permutations and combinations failed. The move by the government was questioned by Opposition leader Narasingha Mishra and many others in the state. Their arguments were that if the state assembly was not even running for 60 days, then why was there a need to create a Vidhan Parishad? The need for the upper house in the States is always a contentious issue across the country. Sensing that the government cannot increase the number of ministers in cabinet, the government created positions above the levels of Principal Secretary. This was a good starting point to rope in people from the industry to lead missions in the state. For example, Sam Pitroda was heading IT mission, Subroto Bagchi was heading Skills mission and Srinath Reddy was heading Public Health portfolios. They were all offered ministerial positions to lead those departments. Segmentation of professional bodies, creation of new professional bodies and bringing them closer to party lines are some of the innovative approaches adopted in Odisha. How it fulfils constitutional obligation of a government and for that matter, a party is a complex equation. In the last two decades, there is a visible gap between the haves and have-nots. Irrational and unscientific doling of freebies and entitlements has already created economic divide in villages and rural pockets. While contractors and suppliers at the village level have accumulated huge wealth, the below poverty line families have been deprived of basic entitlements. In fact, the circulation of money in rural areas increased consumption of liquor, contrabands and luxurious foods resulting in subsequent increase in crimes. People at the receiving end, at the bottom of pyramids, have reserved their verdict in the upcoming General Elections. It will be an eye opener when it comes to the excesses of bureaucratic infusion in the democratic setup.